Why would the Los Angeles Chargers, an AFC team with Super Bowl aspirations, want to help the Steelers, a conference foe with that same goal, make the postseason, as the title of this article suggests? Is it because the Chargers defeated Pittsburgh, 33-30, in a Week 13 match-up at Heinz Field and think they’d be able to prevail again in a postseason rematch? Could it be because the Ravens, Los Angeles’ opponent this Saturday night, are only a half-game behind Pittsburgh in the AFC North and would be a much tougher out in a playoff rematch? Scenario number one is plausible, that is, of course, if Los Angeles didn’t escape with the aforementioned victory over the Steelers after trailing, 23-7, at halftime. The theory on scenario number two would also hold water, if not for the fact that Lamar Jackson, a rookie, would start at quarterback for Baltimore in any hypothetical playoff rematch against accomplished veteran Philip Rivers and the Chargers. No, the real reason the Chargers want the Steelers in the playoffs has nothing to do with Pittsburgh and everything to do with Los Angeles. You see, the Chargers (11-3) are tied with the Chiefs for the top seed in the AFC. Los Angeles and Kansas City also play in the same division–the AFC West–and the runner-up would be relegated to the fifth seed and the very real prospect of not only having to play three postseason games to get to the Super Bowl, but playing all three games away from home. It’s one thing to get to the final few weeks of the regular season knowing that, because of your record, your playoff journey will begin on Wildcard Weekend, regardless of whether you’re a division winner or just an at large wildcard team–such is the fate for the Steelers (8-5-1) and/or Ravens (8-6). It’s quite another to have a chance at the top seed and all the trapping s that go with it–including homefield advantage and a bye– only to drop all the way down to an at-large wildcard team. NFL history is littered with really good teams who were victims of playing in the same division as other really good teams. More often than not, the former doesn’t make it to the Super Bowl. Recent history includes the 2008 Colts, who won their last nine regular season games to finish with a 12-4 mark but lost out on the AFC South title to the Titans before falling to the 8-8 Chargers in the wildcard round; the 2010 Saints, who finished with an 11-5 regular season record but lost the AFC south to the Falcons and had to travel to Seattle where they lost to a 7-9 Seahawks squad; and, of course, the 2011 Steelers, who finished 12-4 but lost the AFC North title (and a bye) to the Ravens before losing the wildcard game against Tim Tebow and the 8-8 Broncos. Taken from the grade book of a teacher depressed to see his students tripping instead of leaning in as the finish line approaches, here is the Pittsburgh Steelers Report Card for the meltdown against the Chargers. Sure, the Steelers had a partially blocked punt that was nice. Jordan Berry boomed off some nice punts. But Chris Boswell missed another extra point. And the Steelers special teams seemed to commit penalties on each return. Again. And of course there’s the punt returned for a touchdown. Whenever a team suffers such a catastrophic 2nd half meltdown, the easy out is to point the finger at the coach for allowing complacency to set in. The Steelers however, showed no lack of hustle or focus in the 2nd half. No one can be accused of mailing it in. And nor can Mike Tomlin be faulted for the critical plays where officiating wasn’t at the issue. Tomlin didn’t throw the pick, miss the PAT or collide with his fellow defensive back to break up an interception. With that said, Ben Roethlisberger has now attempted over 45 passes or more in 4 of his last 5 games. While the results are not universally bad, a more balanced approach would be welcome, particularly because the Steelers have shown they can run the ball. Keith Butler and Mike Tomlin need to take a long look at a run defense that suddenly seems to be gouged with double-digit yard runs with alarming regularity. Had the Steelers won, this space would consider several candidates for the award. But critical failures in all three phases contributed to the second half meltdown and trying to award an Unsung Hero Award feels a little bit too much like the pro version of giving out a participation trophy so we won’t do it here. In August 2015 the Pittsburgh Steelers made the most controversial free agent decision in the franchises history, when injuries to Bruce Gradkowski forced them to find a veteran presence to back up Ben Roethlisberger. The Steelers of course signed Michael Vick, who like Mike Tomlin is a Tidewater Virginia, native. Much of Steelers Nation was up in arms, not because of anything that Mike Vick had done off the field, but because of his conviction for participating in a dog fighting ring. Mike Vick saw limited action in preseason, but at the time signing him looked to be a no-brainer as he sliced through opposing secondaries. However, Vick saw action for real in week 3 when Ben Roethlisberger got injured vs. St. Louis. He closed out the game with a win, but his performance was OK. A few days later in a Thursday night game at Baltimore, Vick struggled, although he did hit Antonio Brown perfectly in the end zone only to see Brown drop the ball. Vick continued to struggle for 3 quarters vs. San Diego, before he came to life, and helped the Steelers come back to win. A week later he was shaky again vs. the Cardinals, until straining a hamstring, forcing Landry Jones into the line up. Mike Vick is a franchise quarterback and someone who is no stranger to pressure. He pulled it out when he had to vs. San Diego, and with a year of experience under his belt, should be able to step in if need be. The fact that Landry Jones kept the number 2 quarterback spot long after Vick fully regained his health speaks volumes about where the coaches see Vick. Signing Michael Vick was the right thing for the Steelers to do, in fact, the Steelers would have been wise to consider using him in vs. Denver had Ben Roethlisberger had to come out. But Vick probably gave the Steelers the last quality quarter of football he had left in him vs. San Diego and it’s time for the team to move on. Steelers defensive end Cameron Heyward got a lot of air time during the Steelers Monday Night victory over the San Diego Chargers. And so he should have, Heyward had in the estimate on of Neal Coolong at DKonPittsburghSports, the best game of his career. Unfortunately, all that attention came at a price for Heyward. NFL fined Cam Heyward exactly $5,787 for displaying personal message on his eye black, even if it was a tribute to his father, “Iron Head”. There’s only one word to describe the NFL’s Cameron Heyward uniform fining: Inane. The League will not grant permission for any club or player to wear, display, or otherwise convey messages…which relate to political activities or causes, other non-football events, causes or campaigns, or charitable causes or campaigns. The reference to “Iron Head” was to Cameron Heyward’s late father Craig Heyward. Craig Heyward was a stand out star on the University of Pittsburgh in the 1980’s and truthfully “Craig Iron Head Heyward” was and remains the only college that I wanted the Steelers to draft. And that’s simply because as a high school sophomore, I saw ESPN highlights of him, say that he was playing for Pitt, and remembered Chris Berman saying “They call him IRON HEAD.” Heyward earned his legend. A friend of my brother’s who played at Annapolis told me that his friends on the defensive line “took tickets to see who would tackle Heyward” because Heyward inflicted so much punishment on tacklers. The Steelers passed on a drafting Craig Heyward opting to take Aaron Jones while, the New Orleans Saints picked Heyward. Heyward had a solid 10 year NFL career playing for the Saints, Bears, Falcons, Rams, and then retired after he played a final season for the Colts. But his battle with cancer had already begun, as he was diagnosed with chordoma malignant bone cancer. After surgery and radiation the cancer went into remission, but it was back in 2005 and in 2006 it took his life. As everyone knows the NFL supports breast cancer research in October in part by incorporating pink into teams uniforms. So it seems only logical that Cameron Heyward would honor his father’s memory and battle with cancer by spelling out Iron Head with his face paint. …Meanwhile, the side judge who “forgot” to stop the play clock after the Charger’s final kickoff got suspended for one game – with pay if rumors are correct. So if you screw up in a way that very much could have altered the competitive balance of the game, you get a slap on the wrist. But if you honor your father creatively, you get fined. The NFL fining Cameron Heyward for painting “Iron Head” is simply inane. Deep passes to please the fantasy crowd, and three-yards-and-a-cloud-of-dusty rushing for the purists’ pleasure. Ultimately the Pittsburgh Steelers prevailed 24-20 in this Monday Night Football test of wills and they did so because during the game’s two critical junctures Mike Tomlin held fast to an timeless quality that has nothing to do with football: Trust. The San Diego Chargers entered Monday Night at 2-2, having won their last matchup in overtime, thanks to a penalty that allowed them to re-kick a field goal. The Pittsburgh Steelers arrived in San Diego having lost in overtime after having missed two kicks as the clock wound down in regulation. The Chargers drew first blood, and they did it quickly and seemingly effortlessly. Perhaps Pittsburgh would go gently into the night after all? Fortunately, the Steelers defense was not prepared to accept mediocrity. 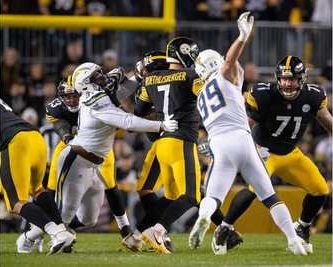 After averaging 16.8 yards per carry on San Diego’s opening drive, the Steelers held the Chargers to an average of 5.0 yards during the rest of the game. And this effort came on a hot humid night when the defense played almost a game’s worth of snaps in the second half alone. The modern NFL is geared to produce high scoring games featuring prolific passing and, truth be told, those fireworks help make the game what it is. 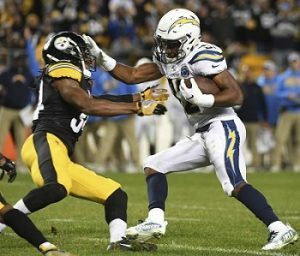 But first three quarters of the Steelers Chargers matchup featured none of that, and instead gave fans a classic chess matchup. The game cannot sustain itself on such defensive stand offs, but they are enjoyable to see every so often. Credit the Keith Butler and the entire Steelers defense for authoring yet another performance worthy of epic proportions. The Steelers first 10 offensive processions finished like this: punt, punt, punt, punt, field goal, punt, interception on a Hail Mary at the end of the first half, punt, punt, punt. Whether you’re talking Pop Warner or Monday Night Football, that’s a recipe for losing football. But when the third quarter ended, the Steelers weren’t simply in the game, they were leading, thanks to Antwon Blake’s 70 yard pick six. Chargers had nowhere to run. But Philip Rivers never flinched, even if he was playing behind an offense line held together with spit, duct tape and bubble gum. Instead, he marshaled his team, and looking every bit like a field general as he moved them down the field in the 4th quarter, scoring twice, doubtlessly leaving the field each time feeling like he’d left the Steelers on the ropes, given how badly Michael Vick was struggling. In fact, Mike Vick looked every bit as tentativein his second start and as he had in his first. For those not fluent in Spanish, my friend Gustavo said “We’re screwed. Since this is a lost cause, we should give Landry Jones an opportunity.” On ESPN former Super Bowl winning head coach John Gruden voiced similar thoughts. Fortunately, such ideas never cross Mike Tomlin’s mind. On Monday morning Ivan Cole of Going Deep on the Steelers rhetorically asked if too much coaching could get in the way of good football. At its core, Cole’s question is an age-old variant of the “Nurture vs. Nature” balancing act that every teacher, coach and parent struggles to perfect. During the 4th quarter of the Steelers Monday Night win over the Chargers, Mike Tomlin proved he’s got pretty good balance on that question. Tomlin is a big believer in investing in having a veteran backup quarterback. There’s no substitute for experience and there’s no substitute for in born talent. When you can put the two together, great things can happen. For 3 quarters, Mike Vick played like a washed veteran, who was struggling in an unfamiliar system. On paper, Landry Jones familiar with the system figured to give the Steelers an edge. On the sidelines, Ben Roethlisberger saw a weakness in the San Diego defense. With Todd Haley’s approval, he drew up a play with Mike Vick and Markus Wheaton. Moments after Gruden called for Vick’s benching, Mike Vick entered the game, rolled out, fired off a lighting quick pass to Wheaton that he took 71 yards to the house. Philip Rivers of course regained the lead. There the Steelers had the ball on the 1 inch line, with 7 seconds left. That left Mike Tomlin with a choice. He could take the safe route and kick a chip-shot field goal and play for over time. Or he could go for it all. Tomlin opted to go with Le’Veon Bell, arguably the most talent player on the field. Bell delivered, ran the half yard and earned a touchdown. Faced with an all or nothing prospect, Mike Tomlin opted to trust the game by putting the ball into the hands of his most talented player on the field. And because of that trust, the Steelers left San Diego at 3-2 with their first west coast victory in a decade. The Pittsburgh Steelers win a photo finish vs. the San Diego Chargers. And that can only mean one thing Steelers Nation, its time to vote for Steelers Game Ball Winners. There is no shortage of candidates tonight. Michael Vick might not have won any style points, he won’t make anyone forget he’s not Ben Roethlisberger, but he made handful of plays precisely when the Steelers needed him to make them. Le’Veon Bell played like a man on fire. But Bell had help. Markus Wheaton showed why he is an unrated threat and Darrius Heyward-Bey again proved he is capable of coming down with the ball when the Steelers need him to. Heath Miller only had three catches, but as he always does, Heath made each and every one of them count. But for all of the drama on offense, the Steelers defense more than held its own. Shamarko Thomas got some of his first action at safety, and recovered a fumble. Jarvis Jones got his first sack and stripped the ball that Thomas recovered. Antwon Blake made yet another splash play on defense bringing a pick six to the house. Lawrence Timmons led the defense in tackles. James Harrison helped snuff out a key third down pass on the part of the Chargers. Ross Cockrell is making Kevin Colbert looks smarter and smarter every week. Cameron Heyward and Stephon Tuitt continued to terrorize in the backfield. Bud Dupree had yet another sack. And let’s not leave out the special teams, with Chris Boswell nailing his first field goal, and Dri Archer made some noise in the return game, while Roosevelt Nix showed why Mike Tomlin kept two full backs. What a game. Check back tomorrow Steelers Nation for full analysis of the Steelers win over the Chargers, but for now take a moment to vote the Steelers game ball winners. Remember, you’re not limited by the selections you see, you’re free to write in player or coach’s name. In what amounts to a minor surprise, the Pittsburgh Steelers have ruled starting inside linebacker Ryan Shazier out vs. the San Diego Chargers. Ryan Shazier was injured at the tail, tail end of the Steelers 43-18 victory over the San Francisco 49ers. At the time Steelers head coach Mike Tomlin described Shazier’s injury as simply “bumps and bruises” along the way. However, Shazier did not play in the Steelers win over the St. Louis Rams, nor did he play in the Steelers overtime loss to the Baltimore Ravens. Shazier however did return to practice this week and, according to Ralph Paulk of the Pittsburgh Tribune Review, Shazier pronounced himself “good to go” after the Steelers final practice ahead of the Chargers game. The Steelers however have officially ruled Shazier out vs the Chargers. Sean Spence will replace Ryan Shazier this week, although Vince Williams is also expected to get snaps. Steelers wide receiver Martavis Bryant returned from a four game suspension this week, and Bryant’s return was expected to provide a boost to both Michael Vick and the entire Steelers offense. The Steelers, however, have not yet activated Bryant, and need not do so until Monday afternoon before the game. 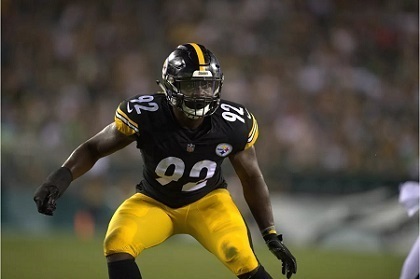 Dale Lolley of the Irwin Standard Observer confirmed that Bryant “practiced sparingly” this week, and Mike Tomlin does not like to play younger players who’ve had less than a full week of practice. Given the porous run defense of the San Diego Chargers, combined with the fact that the Steelers are already playing without Ben Roethlisberger, the Steelers can be expected to lean heavily on Le’Veon Bell and DeAngelo Williams. Beyond ruling Ryan Shazier out vs chargers, the Steelers listed Cortez Allen as questionable, Matt Spaeth (hand), Daniel McCullers (knee), Markus Wheaton (ankle) and Ross Ventrone where all listed as questionable. Can Martavis Bryant Help Michael Vick the Way Eric Green Helped Bubby Brister? How much can Martavis Bryant help Michael Vick? And can a big-play receiver really help a struggling quarterback? The latter question rarely gets the discussion it deserves. When a star running back’s performance slips, the smart observer first looks to the performance of the offensive line playing in front of him. Jerome Bettis production dip in 1998 and 1999 came in direct proportion to the decline of the Steelers offensive line. When the line got better, so did Jerome Bettis. Decrypting the link between quality quarterbacks and quality receivers is far more challenging. On the flip side, every football fan knows Dan Marino as Hall of Famer, but who under 40 remembers the names Mark Duper and Mark Clayton? Steel Curtain Rising doesn’t propose to answer the larger question here, but we do suggest that Steelers history supplies an example of a big play receiver giving a struggling quarterback a boost when both he and his offense needed it the most. To find that example you need to go back to Chuck Noll’s foray up Walton’s Mountain in 1990. Lost in the afterglow of the 1989 Steelers story book season is the fact that the 1989 Steelers offense finished last in the league in total offense. Chuck Noll sought to rectify that by hiring Joe Walton as his offensive coordinator. Noll’s decision was a disaster. The Steelers offense struggled. 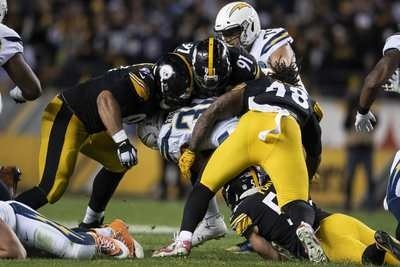 During preseason sheer chaos reigned when the Steelers had the ball. Things failed to improve when the games started, as the 1990 Steelers went the entire first month of the season without scoring an offensive touchdown. No one on the Steelers offense was happy with Joe Walton’s system, but none complained more loudly or struggled more than quarterback Bubby Brister. Things changed for the better in October, and they changed thanks to the arrival of one man. That one man would be first round draft pick Eric Green. When Bryant’s suspension began, Steel Curtain Rising offered Eric Green’s substance abuse troubles as a cautionary tale for the young wide receiver. Today we remember Green’s sensational rookie year and the difference he made to a Steelers offense that could do nothing but struggle. The 1990 Steelers fielded two different offenses one with Eric Green and one without it. It is almost fair to say that Bubby Brister was a different quarterback with Eric Green in the lineup. That’s not 100% accurate, but he completed 10% more of his passes, threw twice as many touchdowns as interceptions, and threw for 60 more yards per game. Of course the analogy of the 1990 Steelers and the 2015 Steelers is very imperfect. built to run, even if Walton favored the pass. And unlike Eric Green, Martavis Bryant is fortifying an already strong receiving trio of Antonio Brown, Markus Wheaton and Darrius Heyward-Bey. It’s also right to acknowledge that while Eric Green did provide a big boost, he was no panacea for Joe Walton’s offense. The unit still struggled at critical times, and Brister never mastered it. Still, the historical symmetry between Green’s insertion into the 1990 Steelers offense and Bryant’s return to the 2015 Steelers offers a final, enticing parallel. 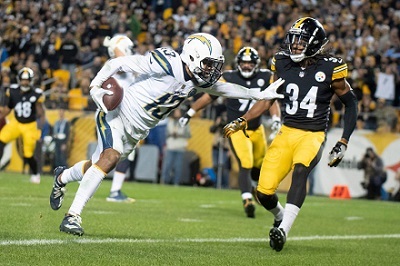 Eric Green’s rookie breakout game came in week five just as Byrant’s return comes on week five, and the Pittsburgh Steelers opponent in week five of 2015 is none other than the San Diego Chargers, just as it was in 1990….